If you're like me, you've been thrown into this ill-timed vacay (from work) for about a week now. 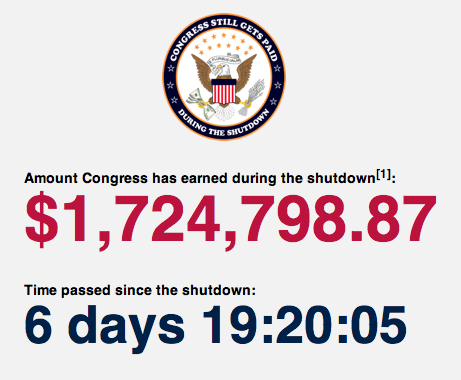 And while the term "Government Shutdown" has been plastered all over headlines and social media postings since before the actual shutdown even began, there are those that haven't been SHUTDOWN: CONGRESS. Over at Huffington Post, I came across a tracker of the cumulative pay for all Congress members since the official Shutdown has began. And let me tell you... hearing and/or thinking: "..but Congress continues to get paid.." doesn't even hold a candle against the huge, shining flood light this tracker serves as. Especially, with the looming issues of the government hitting the debt ceiling soon. This earns infinite shakes of my head.